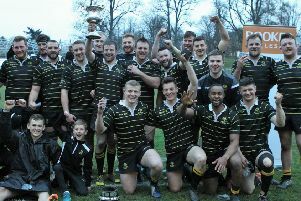 Jed Thistle lifted the 2015 Borders’ Semi-Junior Sevens title on Saturday but were beaten in the final of their own event by a resurgent Melrose Wasps side. After eight rounds the Thistle were crowned overall winners, having won four events outright, been runners-up in one and semi-finalists in three others. The gruelling series, following on from a long but successful XV-a-side campaign, appeared to be taking its toll on the hosts however, as they ran out of steam in the final match, which the Wasps won comfortably 45-19. In the semi-finals Thistle disposed of Kelso Quins 24-12 with the Wasps being pushed into extra time by Hawick Wands before running out 17-12 winners. Melrose Wasps (57) finished the series five points behind the champions, who amassed 62 points in total, with Hawick Wanderers some way behind in third.